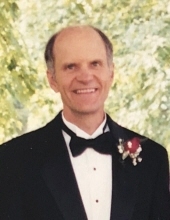 Wayne Edsel Johnson, age 75, died Friday afternoon, February 1, 2019, at his home in Stanton concluding a courageous two year battle with cancer. He was born December 16, 1943 in Edmore, the son of Phillip and Effie (Sodman) Johnson. On June 23, 1973, he married Carolyn McPherson. Wayne was a faithful follower of Jesus Christ, a listening ear, a counselor, a friend to many, treasured by all. He was a bicycle rider, a traveler, a Harley rider, an engineer, a fixer, and a Model T enthusiast. Wayne is survived by his loving wife of 45 years, Carolyn; children, Dan (Cheryl) Johnson of Stanton, Beth (Mark) Campbell of Littleton, CO, David (Michelle) Johnson of Stanton, and Jon (Marsha) Johnson of Summerville, SC; grandchildren, Danielle, Ethan, Avery, Caleb, Jacob, Andrew, Micah, Isaac, Asher, Emmet, and Gretchen; brother, Bruce (Ruth Ann) Johnson of Lakeview; sister, Phyllis (Paul) Forsythe of Mesa, AZ; brothers-in-law, Rocky McPherson of Sterling Heights, Kenny (Charlann) McPherson of Oviedo, FL, and Dennis (Grace) McPherson of Southgate; and many nieces, nephews, other relatives, and countless friends. He was preceded in death by his parents and siblings, Geraldine Petersen, David Johnson, and Bernie Johnson. Funeral services in celebration of Wayne's life and faith will be held at 11:00 am Tuesday, February 5, 2019 at Greenville Community Church. His brother-in-law, Rev. Paul Forsythe, will serve as officiant. Visitation will be Monday from 4:00 to 7:00 pm at Hurst Funeral Home. Interment will be in Forest Home Cemetery, Greenville. Memorial contributions in Wayne's honor may be given to Greenville Community Church. To send flowers or a remembrance gift to the family of Wayne Johnson, please visit our Tribute Store. "Email Address" would like to share the life celebration of Wayne Johnson. Click on the "link" to go to share a favorite memory or leave a condolence message for the family.